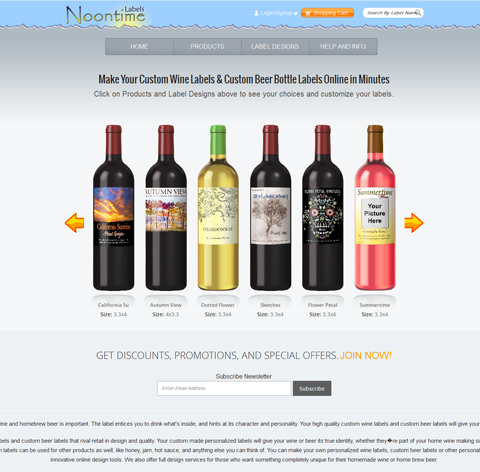 Our client, Noontime helps low volume and home winemakers and brewers to create and print personalized custom wine labels & custom beer labels for short-run production, home use, wine gifts, wine wedding favors, promotions, and special events. 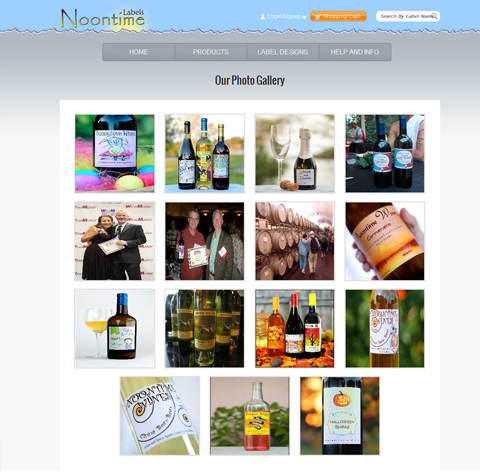 They utilize their pre-made templates and online design tools to design distinctive labels in just few minutes. All their labels are printed on 8.5 in. x 11in. sheet fed, peel & stick label stock. They use solid ink printing process to provide saturated colors and make their labels water resistant and will not smear or smudge. 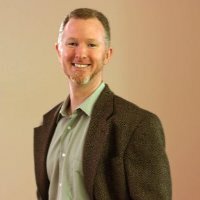 They provide full design services for those who want unique labels for their wine or home brew beer. 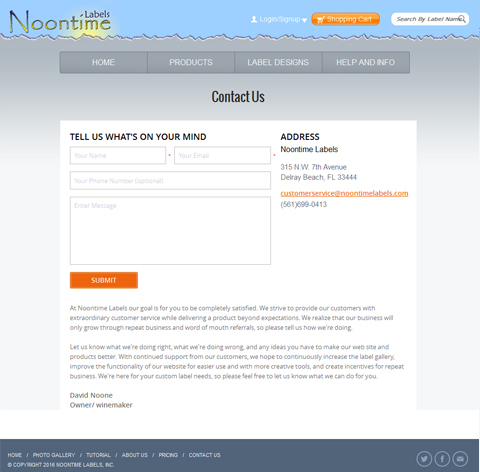 Our client required a website to expand its business to the online world. They need a user-friendly online portal where users can approach for their label requirements. The website should contain all their services and different types of labels including vinyl waterproof labels, paper label with permanent adhesive, paper label with removable adhesive and general labeling practices. They needed a customized e-commerce platform where users can customize the labels by using customization tools as per their requirements. The platform also required a retailers account and the account roles and features are categorized by admin/owner of the platform. 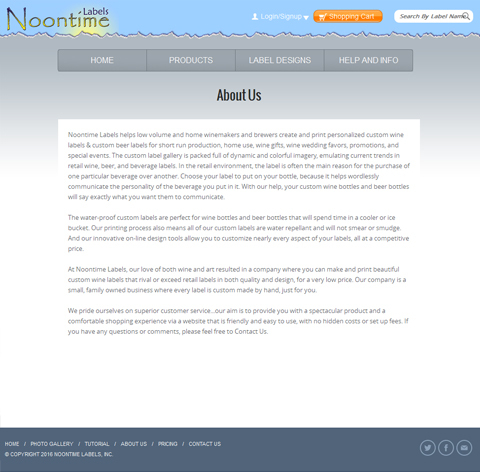 We recommended the best solutions to accomplish our client needs. 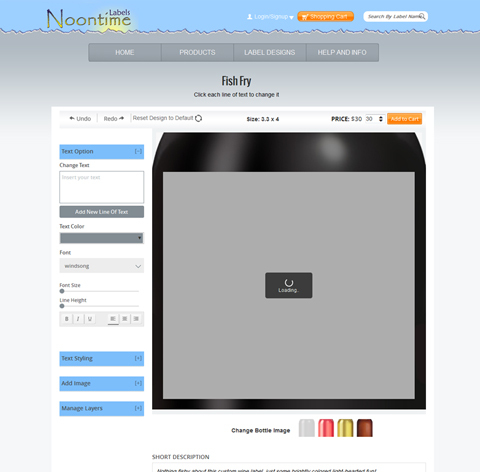 Our team faced major challenges with the development of customized tool. 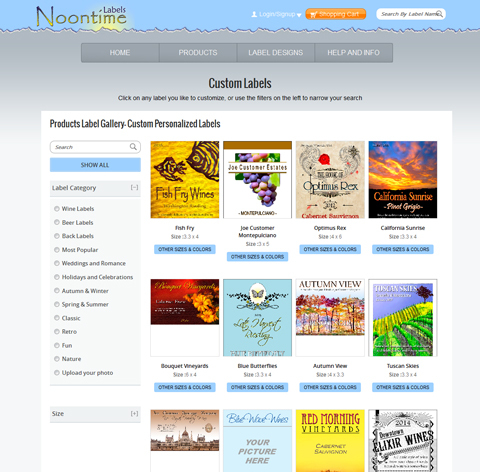 We have used customization tool which were designed/developed by using canvas and has maximum features to helps users for customize their labels easily. We also faced the challenges related to retailer module because there are 4 types of retailer accounts with different features and functionality. We allocate the dedicated resource with the expertise of canvas and open source. Our team pays attention on its user-interface to make it look impressive and unique so that more and more users attracts towards it and approach the client for label work. Front-end Our designers dedicatedly worked to make the website interface more user-friendly and interactive while meeting client's requirements. We developed a responsive website compatible with all the browsers and enhance the business to a larger extent. Backend For managing the complete data, we required robust backend architecture therefore our team utilized MySQL database. Our team worked on creating values in drop down menu by constructing an infrastructure which pull the value from database. By using advanced database programing and framework we had created a scalable and robust backend support for the website. Development Process Our development team was very focused and using specific frameworks and methodologies to complete the website development phase. We keep updated with emerging technologies and used them for delivering cutting edge and high impact solution. Our developers used PHP due to its scalability, easy deployment and simplified coding. I got an excellent tool developed in Angular.JS for the custom labelling in my website. Team did exc..